Mia Hamilton lived the perfect life with her husband, university teacher Zach, and their two-year-old daughter. But everything changed when Zach committed suicide on the same night one of his students vanished. Five years later, just when Mia is beginning to heal, stranger Alison walks into her life, saying her husband didn’t kill himself. Fragile, slight Alison leads Mia on a path into Zach’s past, and Mia begins to think she never really knew her own husband. As the secrets revealed get darker, Alison becomes harder to read, and Mia starts to wonder – why is Alison so keen to help? And then a piece of the puzzle appears in an impossible place, and Mia has to ask, is she losing her mind, or should she be afraid for her life? I have a slight, ok a big, confession to make. 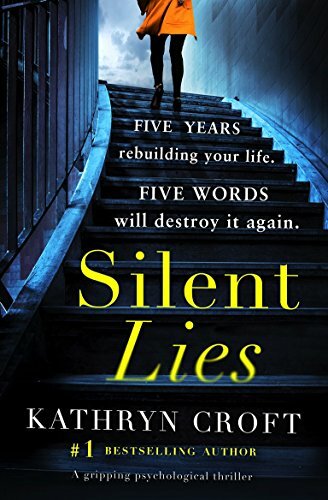 Even though I have all of Kathryn’s books on my mahoosive ‘To Be Read’ pile, ‘The Silent Lies’ is the first of her books that I have actually read. It’s safe to say that I am now a huge fan of hers and reading her other books is now a huge priority. I can’t honestly say that I warmed to any of the characters but then I am a suspicious devil and suspected that each character was telling a few porky pies (lies). Not taking to the characters is not necessarily a bad thing because it means that you can keep an unbiased overview of the situation. Mia was married to Zach, who was a university lecturer and who apparently committed suicide the same night that one of his students went missing. Mia takes quite a while to recover from events and five years after the apparent suicide she has a successful career as a counsellor/ therapist and she has embarked on a new relationship. Her settled life is upscuttled by a new client called Alison, whom she has never met before. Alison tells Mia that her husband Zach did not commit suicide after all. However, when Mia confronts Alison, Alison denies ever saying this. Mia delves further into Zach’s life and she begins to realise that she never really knew her husband at all. Mia is also left wondering why Alison is so keen to apparently help her. A piece of the puzzle appears in an impossible place and Mia is left wondering if she is losing her mind or should she be afraid for her life. So who do you believe? Well I asked myself that self same question all the way through and the answer kept changing. I have to say that ‘Silent Lies’ is superbly written. Sometimes when I read a book I have a guess as to who is to blame and what is going to happen. More often that not (I don’t mean that to sound big headed) I am along the right tracks but not in this case. Oh no Sirree I was kept guessing all the way through this book. I became addicted to reading this book and I literally had to take it everywhere with me. No my Kindle wasn’t glued to my hand, but I simply had to read on to see what was going to happen and to discover the truth. The pages were turning that quickly that it was almost as if they were turning themselves an before I knew it, I had finished the book, which I was so pleased about. Don’t get me wrong, I wasn’t pleased because the book is badly written- that couldn’t be further from the truth- but I was pleased because I knew how the story ended, who was telling the truth and who was telling porkies (lies). I really did feel as though I had been on the world’s longest, twistiest, most stomach churning rollercoaster ever after I had finished the book. Just when I thought that I could reclaim my stomach, then off the rollercoaster/ story would go again. At times, I almost had to read through my fingers and hold my breath because I genuinely feared what was going to happen next. I began to think that surely there can’t be any more revelations to come but come along they did. In short, I absolutely totally, utterly and absolutely LOVED reading ‘Silent Lies’ and I would recommend this book to anybody. This is one book that is certainly going to stay with me for a long time to come. In fact I think I am going to have to read it a second time just to make sure that I really did read what I think I had read. I award this book an easy 5* out of 5* but I would have awarded it more stars if I could have because it really was an excellent book, even if it did creep me out at times.